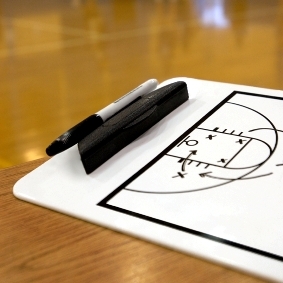 I’ve gotten a whole bunch of requests for help with [tag]basketball practice plans[/tag] for teams with limited practice time. Here’s an idea that was sent to me. Very creative! I’m in a [tag]basketball[/tag] league where we only get two 2 hour practices a week. With limited time I have to combine [tag]basketball drills[/tag] to get everything in. I have my team practice their blocking out and rebounding at the end of practice while each player shoots their free throws. I have 10 players, and each shoots 10 free throws. That gets me a 100 rebounding attempts. We shoot free throws at the end when they’re the most tired and when it’s crunch time in a game; it only makes sense that we should practice rebounding at the same time. We dominated the boards this year and went Undefeated, winning our championship by 12 points.